A woman was viciously beaten for no apparent reason by a stranger she passed on the sidewalk in San Francisco last weekend, according to San Francisco police. The victim, who was not identified, was taking a walk in Lafayette Park area, near the intersection of Washington and Gough streets about 7:45 p.m. Saturday when a man approached her and started punching her in the head and face. 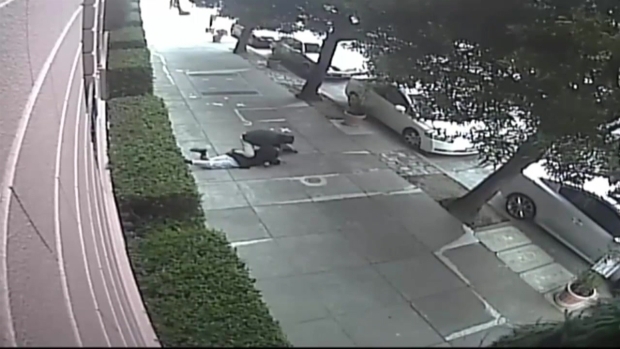 A surveillance video provided by the San Francisco Police Department shows the man striking the woman and knocking her to the ground with the first punch then punching her about 20 more times as she lies on the ground. He then stands over her for a moment before walking off toward the street. The man didn't take anything from the woman, and investigators believe the victim was random and did not know her attacker. Raw surveillance video of a woman who was viciously beaten for no apparent reason by a stranger she passed on the sidewalk in San Francisco last weekend, according to San Francisco police. According to police, the man said something to the woman just as he attacked..
"I believe he asked her to say, 'Say you're sorry,' something along those lines, and she had absolutely no idea what he was talking about because she did not know him," police spokeswoman Giselle Talkoff said. Talkoff said there was little the woman could do other than try to protect herself. "I think she pretty much did what she could," Talkoff said. "It happened all of a sudden, he was larger than her, and she was knocked to the ground. So she had her arms up trying to defend herself, but there was nothing else in a sudden attack like that she could have done." Police said the woman suffered a broken nose and still was in the hospital Wednesday. She told police she was scheduled to have surgery soon. Police released the surveillance video Wednesday are asking for help from the public to try to identify the suspect. They believe the suspect is a white male in his 40s or 50s, with brown hair and wearing a green sweatshirt.